If your thighs are horizontal (with your knees and hips at the same height) when sat on the toilet and your feet flat on the floor then the toilet is probably a good height for you (Disabled Living Foundation, 2009). 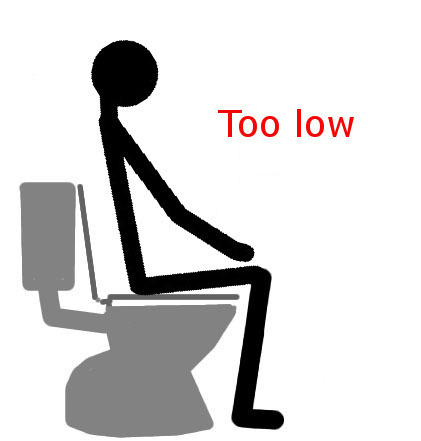 The above diagrams show a toilet that is likely to be too low (the personâ€™s knees are higher than their hips) and too high (the personâ€™s hips are higher than their knees and their feet are off the floor). 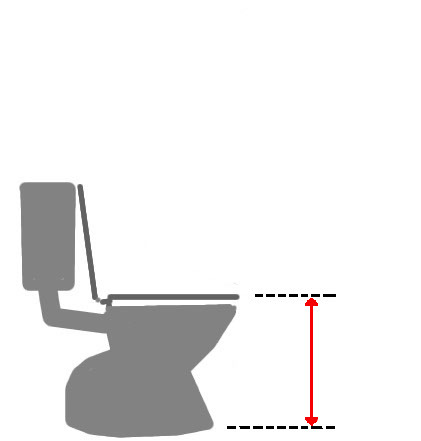 If you wish to check this then the toilet height most likely to suit an individual is approximately the same as the distance between the floor and the bottom of their thigh behind their knee, as shown in the diagram. 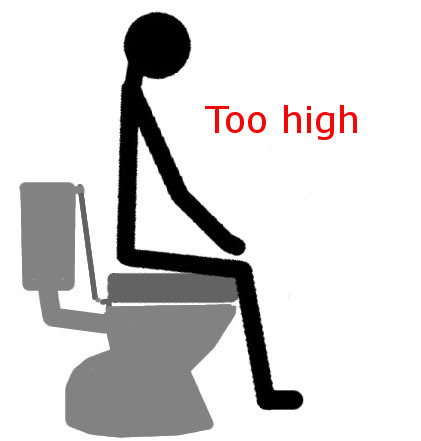 The toilet height should be measured from the floor to the top of the seat. The height to the person's thigh should be measured when they are wearing their usual shoes or slippers. When being measured they should be sat on a chair at a height at which their thighs are horizontal with their knees and hips at the same height, their knee and ankle joints should be roughly at a right angle, as shown in the diagram. When rounding the measurement to the nearest centimetre, round down rather than up (Disabled Living Foundation, 2009). There is a range of equipment that can be used to raise the height of a toilet. Most models of raised toilet seat clamp on to the rim of the toilet bowl and the original seat remains in place stuck in the up position. Some models replace the original seat. When using a raised toilet seat, it is important to check that it is fastened securely and does not move. If you are raising the only toilet in the house, then consider other users including children who may struggle to use the raised toilet safely. Other users of your toilet may need to, or prefer to, remove a raised toilet seat when using the toilet. Consider whether they will be able to remove it and replace it ready for your use. If they remove it, they must know how to refit it correctly (Pain, McLellan, and Gore, 2003). Raised toilet seats with frames and toilet seats with armrests provide handholds that you may wish to use if you feel unsteady or unsupported when sat on a toilet. These sound not be considered if you have a one sided weakness unless it can be fixed to the floor. Always check that the weight capacity of any toilet equipment you use exceeds your weight. Two adjustable knobs (picture 1), that require tightening against the toilet bowl, and a lip at the front that fits over the bowl. Some use the original toilet seat fixing holes or hinge at the rear of the toilet bowl. 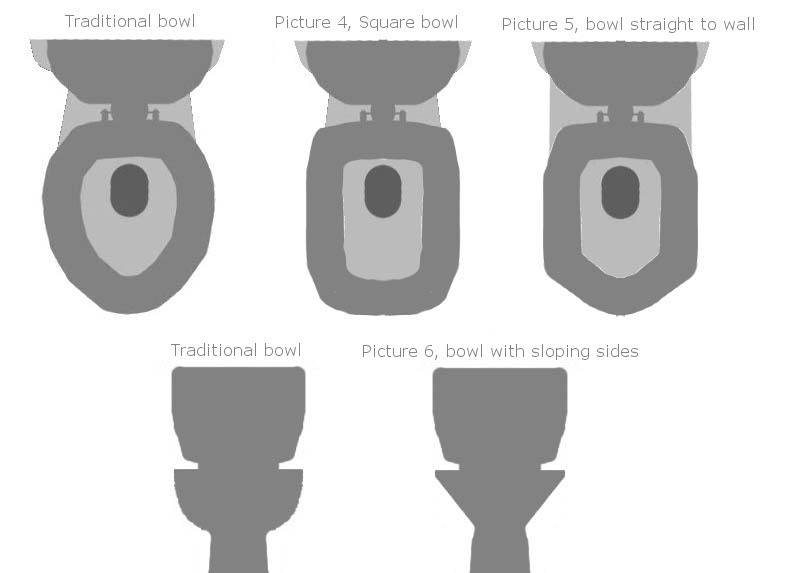 The most suitable fitting for your toilet will depend on the shape of your toilet bowl. Toilet bowls with a non-traditional shape (see pictures 4 and 5) may require a raised toilet seat that fixes to the toilet via the toilet seat fixing holes or hinge or consider a toilet frame with a seat. Toilets with heavily sloping sides to the bowl (picture 6) may require a raised toilet seat with the three adjustable knobs, or one that fixes to the toilet via the toilet seat fixing holes/hinge or a toilet frame with a seat. If you're not sure which type of raised toilet seat to purchase to fit your toilet consult with the retailer, manufacturer or health care professional. You can find your nearest demonstration centre online and take a photo of your toilet to them for advice. 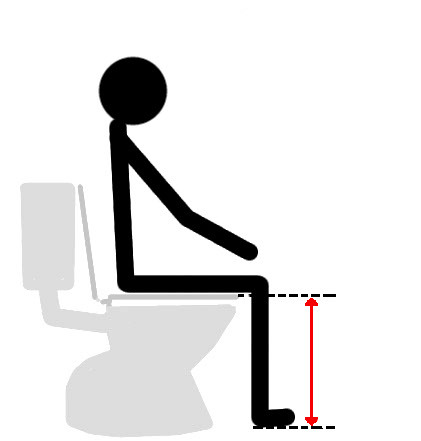 This is only a general guide to toilet height, many individuals will have different needs, perhaps because of restricted movement in their joints, pain or surgery. Thus we recommend you contact your local social services and request an individual assessment with an occupational therapist who can advise on the best solution.